China Domestic Flights Compare all China domestic airlines, get best deal, lowest price guaranteed. China Train Tickets Experience China high speed train, book E-ticket or deliver paper ticket to your hotel. China Hotels Booking No need prepayment for hotel bookings in China, just pay at hotel when you arrive. China City Tours Book a day trip to sightseeings, pickup/dropoff from your hotel. China Car Service with Driver Book airport transfer or full day car service in the city for holiday or business. Yangtze River Cruises Book a cruise tour to explore Yangtze River and Three Gorges. GPS Audio Guide for Beijing Tourist Attractions Expreience GPS audio guide when you visit Forbidden City, Summer Palace, Great Wall, Temple of Heaven. One-stop shop for China domestic air ticket, train ticket, hotels, sightseeing tours, transfer & car, cruises. Extensive products in China's 36 most visited destinations. Completely customized FIT itineraries both over the phone and online, 7 days a week. We provide in-China customer support. Our Beijing office is available to resolve issues and emergencies should you arise during travel in China, as we are conveniently located in the same time zone, we can provide you quick resource accessibility and solution. Independent travelers love us because we offer wide variety of China travel services, competitive pricing, and the convenience of booking all travel components in one place. View all your bookings in My Bookings. GPS Audio Guide in Beijing Attractions: When walking in the attraction, listen to our audio guide to delight your tour. Click on the map to play audio. Book China flight, train, hotel, tours, cruise, car. (Shanghai to Beijing Flight or Train) + Beijing Hotel + Beijing Tours: Visit Great Wall, etc. You can book any of above product seperately, for your trip in China. 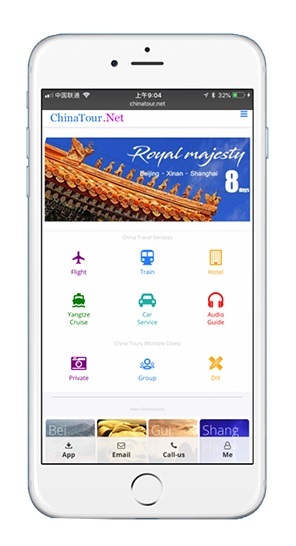 Make use of our knowledgeable service team and enjoy personal communication with local experts who are aware of every aspect of your vacation in China, let us help streamline your planning and travel itinerary creation. We can book China airfare, rail tickets, sightseeing tours, transfer and car service for all the FIT customers. Additionally, we offer a tremendous variety of hotel accommodations for 80+ cities in China: whether you wish to stay in standard 3-star hotels or luxurious 5-star properties. We also have a wide variety of sightseeing services, and also have the ability to special request custom product. Arranging all of your China travel needs is easy and quick. Our website contains valuable resources like suggested tour itineraries, city guides and travel related tools. Take a few moments to build your dream vacation for China today, or call/enquiry us to work directly with our knowledgeable travel specialists, we're always delighted to offer suggestions on designing travel itineraries that will create unforgettable memories for you.